If you want to grow medical marijuana, one of the issues you need to address is making sure that the roots of the plants you grow are healthy. This makes a lot of sense if you consider the role of the roots. In any plants, the roots are responsible for absorbing nutrients and water from the soil or the medium in which they are growing. This is necessary for the metabolism that is required to create new tissue within the plant. 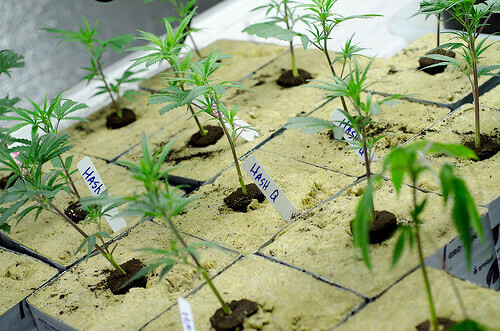 This means that if the marijuana roots are not healthy, the entire plant will be affected. It also means that if you want to end up with high quality plants, you would need to understand how to treat them to ensure that the roots turn out to be healthy. It’s also important that you know how to identify some of the signs that show that the plant might have compromised roots. If you notice such, you can then modify the conditions of the plant as soon as possible. What are some of the signs indicating root damage? One of the most prominent signs indicating that the roots are being damaged is yellowing of the leaves. The greenness of the leaves is usually the result of photosynthesis. When the roots are not in good order, they tend not to absorb the nutrients and water that is needed to carry out photosynthesis. As a result, the leaves will take on a yellow hue due to the reduction in metabolism. Another problem that could be attributable to root damage is wilting. This is brought about by the plants not absorbing enough water from the soil or growth medium, which is a function of the roots. However, you should remember that having the plants wilting does not automatically mean that the problem is with the roots. Other issues that could result in the same include not watering the marijuana enough. Other general signs of root damage include stunted growth as well as the presence of leaves that are far too small. In order for the roots to thrive, they need to be subjected to specific conditions. These include the presence of enough oxygen to ensure that they metabolize nutrients well. Remember, the process of absorbing water and nutrients from the soil requires energy expenditure by the plant. In order to generate this energy, the cells in the roots need to consume oxygen. If there’s too little of it, they are likely to die off, and as a result the entire plant will die as well. Another important factor to consider is making sure that the roots are properly anchored. Even if you decide to use hydroponics to grow the marijuana, you will need to ensure that the roots are supported by the appropriate growth medium. Failure to do this could result in breakage of the roots, which would then compromise the growth of the roots. • Changing the growth medium: Try to find out if the growth medium the marijuana is in is conducive for growth. If not, you might need to change it. For instance, if you grow the marijuana in the garden, you might need to uproot the plants, change the soil and then replant them. • Aerate the soil: If you are growing the marijuana in soil, you should consider aerating it every so often. This is particularly so if the soil has a high concentration of clay soil. Such soils tend to have very few air spaces between the soil particles. This in turn means that there is very little oxygen available to the roots of the marijuana plants, resulting in damage to the roots. Regular aeration will ensure that this does not come about. • When using hydroponics: One of the best ways of regulating the growth of the marijuana plants is by growing them using hydroponic technology. In this way, you can control the types of nutrients the plants will have access to. You will need to get solutions containing such nutrients. Using high quality ones will ensure that the roots receive the right type of nutrition, reducing the chances of them dying away. In summary, the health of the roots of the marijuana plants you are growing is essential for many things, including how fast the plants will grow as well as how healthy they will end up being. Doing all the above to promote the health of the roots is therefore essential. Of course, there is a lot more you can do to facilitate this. For example, doing more online research on growing medical marijuana can yield you more tips on how to handle the entire process better.